What automotive brands are traded most frequently? 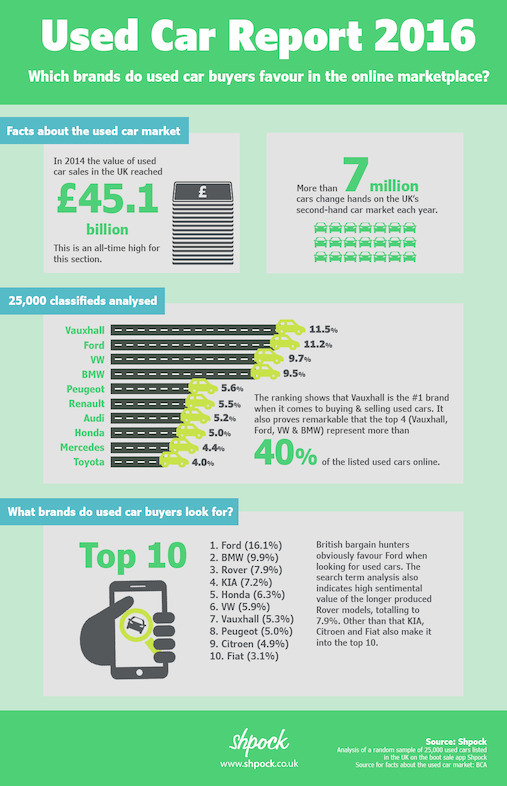 Which brands do UK buyers seek when shopping secondhand cars? Answers to these questions can be found within the data analysis outcomes of Shpock – the boot sale app. A total of 25,000 classified ads in the online market place were taken into account. Revenues of used car sales within the UK have totalled at 45.1 billion in past years, an all-time high for this section. These have been and continue to be generated with over 7 million cars changing hands on the UK’s second hand car market every year. The emergence and drastic growth of online marketplaces during the past few years have enabled private owners and buyers to trade even more easily. Which brands do UK buyers look for when shopping secondhand cars? Analysis of a random sample of 25,000 used cars listed in the UK on the boot sale app Shpock.